Home › New Content › Many New Titles from Deschutes County! Many New Titles from Deschutes County! We were recently able to digitize and add more newspapers from Deschutes County, Oregon! 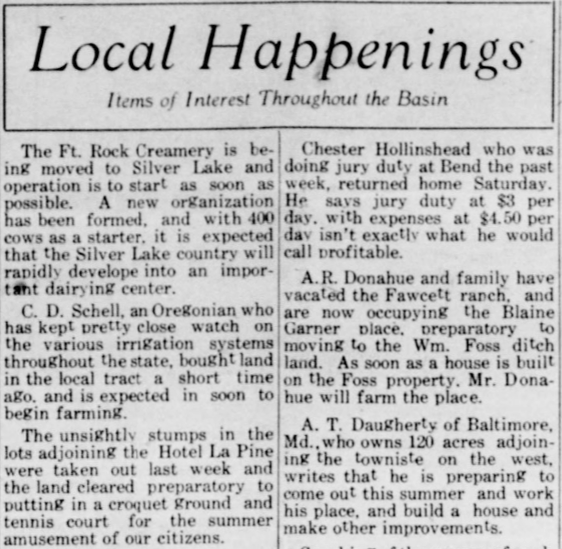 Thanks to the generosity of the Deschutes County Historical Society, we’ve added issues from The Deschutes Echo, La Pine Inter-Mountain, Laidlaw Chronicle, and Redmond Spokesman. The Deschutes Public Library has also provided support, allowing us to also digitize issues of the Abbot Engineer. Check out this recent article in the Bend Bulletin for more behind-the-scenes details about how this project came to be. Of all the issues added, The Deschutes Echo covers the earliest period going back to 1902, while the Abbot Engineer covers the latest period from 1943 to 1944. The Deschutes Echo technically predates Deschutes County, as it was published in the town of Deschutes, a part of Crook County at that time. It had a relatively short run, starting in June of 1902 and going until 1904, at which point it merged with the Bend Bulletin. 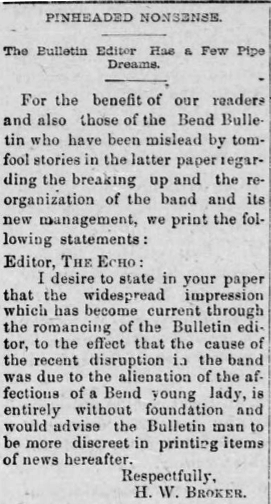 Before this consolidation, though, there was a little bit of a rivalry between the two newspapers, with The Deschutes Echo on at least one occasion accusing the Bend Bulletin of misleading its readers. In 1905, not long after those two newspapers merged, the Laidlaw Chronicle was founded in the nearby town of Laidlaw, later known as Tumalo. 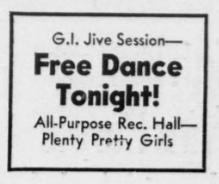 This weekly paper was edited and published by A.P. Donohue, who anticipated that Laidlaw would be a growing town. Unfortunately, Bend would be the one to reap the benefit of a nearby railroad in helping it grow. Eventually, publication of the paper was stopped in 1911, though our coverage only goes to 1908. Around this time in 1911, E.N. Hurd created the La Pine Inter-Mountain. 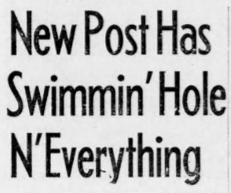 At the time, La Pine was a town of only 40 people, but this modest newspaper still manage to reach a circulation of over 600 by being, as its tagline said, “the only newspaper within an area of a thousand square miles.” It balanced news from the surrounding areas with tidbits about locals in La Pine and neighboring towns. If you wanted to know what was going on with your neighbor down the road, this was like reading a version of today’s Facebook news feed back then. This kept the paper running until 1934. Of this batch of newspapers, the Redmond Spokesman is the only one still in publication today. It was started in 1910, and the issues made available here go through 1914. 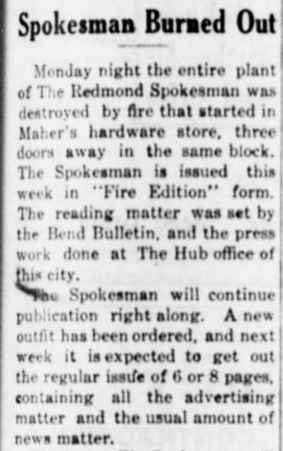 During this time, the paper had two in-town competitors: Oregon Hub and the Redmond Enterprise. The Spokesman soon bought both of them out in 1914, allowing it to continue to grow into the newspaper it is today. However, it almost never made it past 1912 due to a fire that took out their publishing plant. Thanks to help from the Oregon Hub and the Bend Bulletin, though, they were able to release a special “Fire Edition” and continue printing until their new equipment came in. The final paper in this batch is the Abbot Engineer, which is unique in that it was the newspaper for the combat engineers training at Camp Abbot, located in what is Sunriver today. The Engineer offers great insight into the lives of G.I.s in the camp and is a great resource for those researching World War II. The paper’s run ended with the close of the camp and the move of the forces to Fort Lewis. To find out about other aspects of life in central Oregon in the early 1900s, browse through issues of each of these newspapers on the Historic Oregon Newspapers website. Each issue of The Deschutes Echo, Laidlaw Chronicle, La Pine Inter-Mountain, Redmond Spokesman, and Abbot Engineer can be browsed and searched by keyword, thanks to optical character recognition (OCR) technology.